A fantastic long day over some fairly remote hills. I stirred a couple of times during the night owing to the tent flapping in the wind. There seemed to be 15 minutes or so of during winds followed by calm, and it seemed to go on like this through the night (well at least the bits that I was awake for anyway!) I woke up shortly after 6 to find confirmation that it had been cold last night: I had frost on my tent. Although I had already guessed that it had got down to freezing owing to the amount of clothes I had to wear inside my sleeping bag to stay warm. Time to dig out my winter bag when I get home methinks! At around 6:30am I poked my head outside the tent to see the red glow of dawn behind Na Gruagaichean, my first peak for the day. I got the stove on and was soon having coffee and porridge whilst watching dawn's progress. However it was still quite cold so I unfortunately had to do the tent tent back up to get warm again! I read for a bit before packing up and heading outside into the morning sun. A bit of photography then followed to take advantage of the fantastic morning light, before I struck camp and packed my bag. I set off walking just before 8:30am and descended the pleasant ridge to the southeast, glad that I hadn't camped any further down as the sun hadn't reached there yet! A steep climb brought me to the northwest top of Na Gruagaichean (Munro Top). The continuation to the main summit was rocky in places, and I remembered that it was somewhere around here that I first had to use my ice axe in anger to arrest a slip back in the winter of 2001. At around 9:30am I reached the summit of Na Gruagaichean (Munro), which unsurprisingly given the hour I had to myself. The views were excellent in all directions, including along the length of Loch Leven and, in the other direction, across towards the Ben Alder hills in the distance. A fine ridge brought me to the south top of Binnein Mor (Munro Top) and then onwards to my highest point this weekend, the main summit of Binnein Mor (Munro, Marilyn) at 1130m. 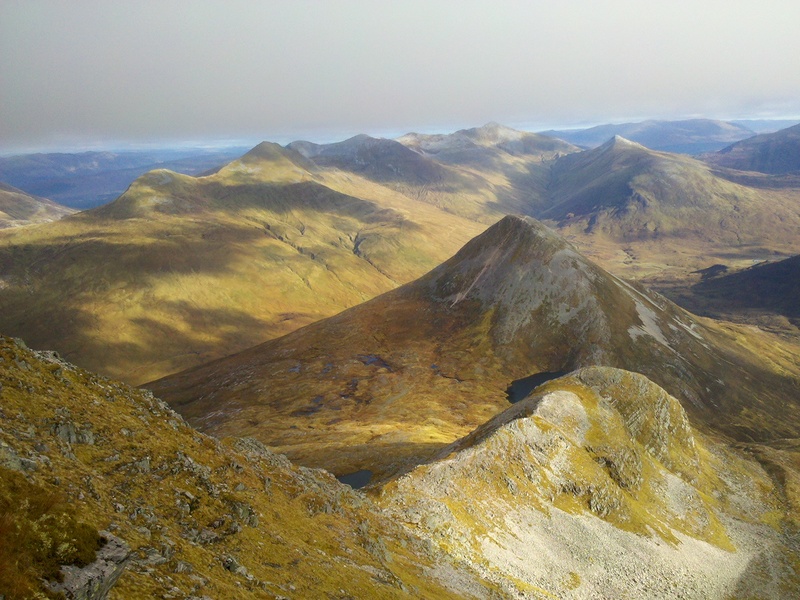 The views from here were again impressive, especially over towards Binnein Beag and the Grey Corries. A steep ascent up scree and rock from the bealach brought me to the summit of Binnein Beag (Munro, Marilyn) at around quarter to midday. This seemed as good a place as any for lunch, so I stopped here a while to admire the amazing views. Looking at my map I concluded that it was approximately the same distance to walk out to Spean Bridge as it would be to walk down Glen Nevis to Fort William but the former option offered the chance to bag another Munro: Stob Ban. This sounded like a good idea and so after lunch I descended the north side of Binnein Beag, which is not to be recommended due to the horrible steep scree and rocks! After heading across a boggy area I eventually reached the Abhainn Rath, which was a welcome sight as I had run out of water on the summit of Binnein Beag! I took a brief break here for food and water, whilst I planned my ascent of Stob Ban. The direct route via Meall a' Bhuirich looked to be unpleasantly steep to begin with. I therefore opted to follow the burn up into Coire Rath, with the aim of ascending Stob Ban via the bealach to its north. The walk up the corrie was pleasant enough and I was accompanied by the roaring of stags all around me. At around 500m altitude, my plan became somewhat unstuck! During my hurried look at the map earlier I had failed to spot that the for the next few hundred metres the burn I was following would be in a bit of a narrow steep sided valley. Therefore there was only one thing for it, which was to take a more or less direct line up the steep ground to the summit! After a long slog, past a group of ptarmigan, I reached the summit of Stob Ban (Munro, Marilyn) soon after 3:30pm. By now it was clear that I was going to struggle to make it to Spean Bridge in time for the bus at 6pm, which I needed to catch in order to make my bus south from Fort William at 7pm. Therefore, taking advantage of the phone signal on the summit, I rang up a local taxi company and arranged to be picked up from the end of the road at Corriechoille. This would save me around 45 minutes, but it was still a long way to go! So after a quick break on the summit to admire the views one last time, I began my descent. There was a reasonable path down much of the east ridge, which brought me down to a nice looking bothy at the end of a vehicle track. I picked up my pace and ascended over the wide pass and down the far side into the woods. Soon I stumbled soon The Wee Minister statue alongside the track, and soon afterwards an unexpected carpark. N.B. This was sent from my phone. At some point during the next week I will be editing this post to include more photos and a route map of the day's walk. Post updated on 12/09/12 to include route map, photos and links to hills; post date also altered to actual date of walk (from 08/10/12). What a great blog, superb photos. Bit worried about you using your ice axe in anger! Beautiful pictures! Will you climb back up again next year?